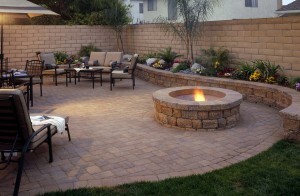 The beauty of installing outdoor patio and fireplace spaces is their versatility. Your new fireplace can be made to suit your budget, your home’s general profile and appearance, and the space available. That means you can easily make it look homey and rustic, or you can use state of the art building materials to craft a majestic outdoor repose that looks great. Either way, the key is to plan your space effectively. Working with a contractor who has a lot of experience with masonry is essential, because the key to a great new installation is having the right combination of building materials to meet all your needs. You will want the stone work to insulate the fireplace itself from any possible safety hazards that could be caused by wind or by nearby debris. It’s also important that it fit into your landscape perfectly, which is why outdoor fireplaces installed by landscaping specialists tend to have such an appeal for homeowners. While these are relatively simple investments compared to other property features, they can become quite complex with the right approach. Even when they are kept simple, though, outdoor fireplaces add a lot of value to a home just by adding some extra visual appeal to the layout of the yard and garden area. Talk to a professional today to get quotes for your home, and find out what it will take to invest in your own fireplace for the back yard.